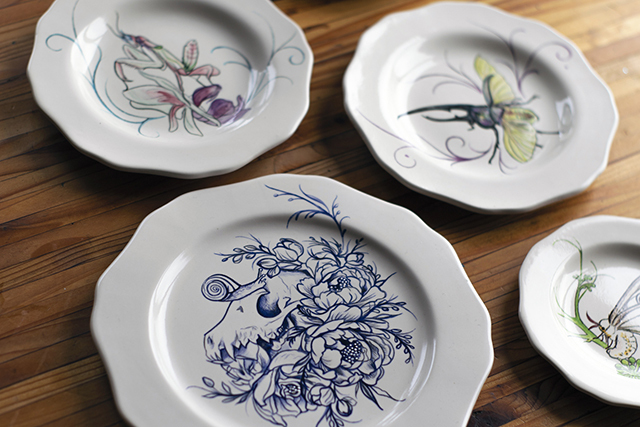 There’s a whirlwind of exciting projects on the near horizon, but before we dive in to those, I thought it might be nice to take a closer look at how each piece I create gets made! 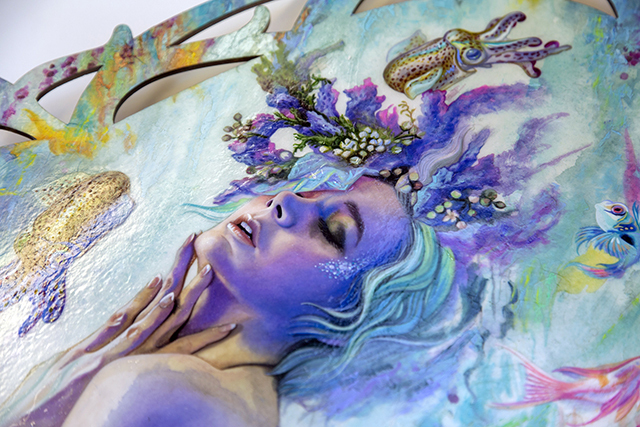 This one is headed to Corey Helford Gallery for their “Art Collector Starter Kit V” opening Dec 1st! 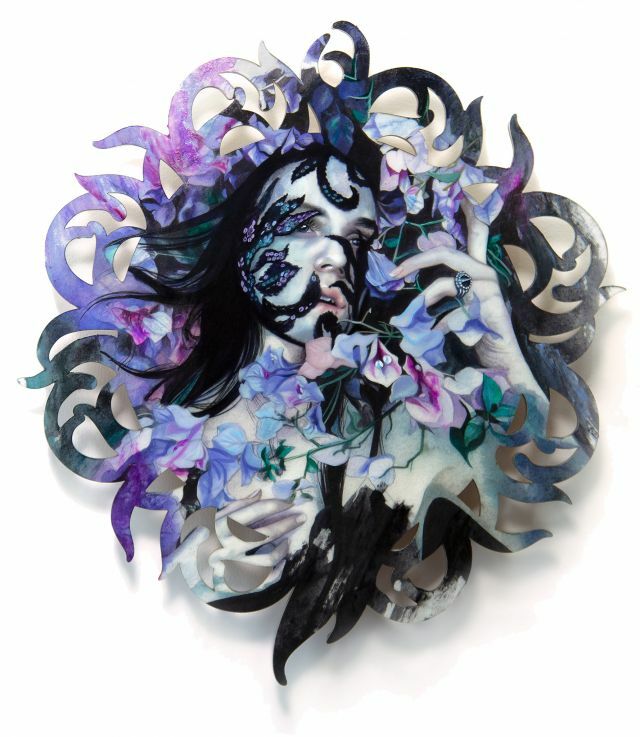 Caught in a dance of breath and entropy, this ghostly muse (the incredible Casstronaut) is entwined with swirling bougainvillea boughs, as organic forms transform her porcelain skin. The force of entropy is the destruction that makes new life possible, and in becoming something new, perhaps she is becoming something greater than herself. 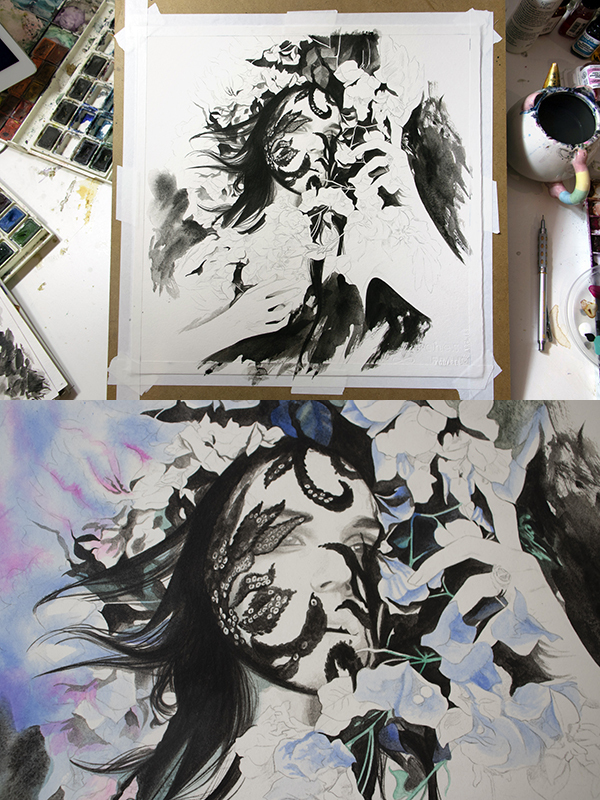 My process developed over many years of experimentation - the foundation was simple watercolor painting, which has been a passion since childhood. 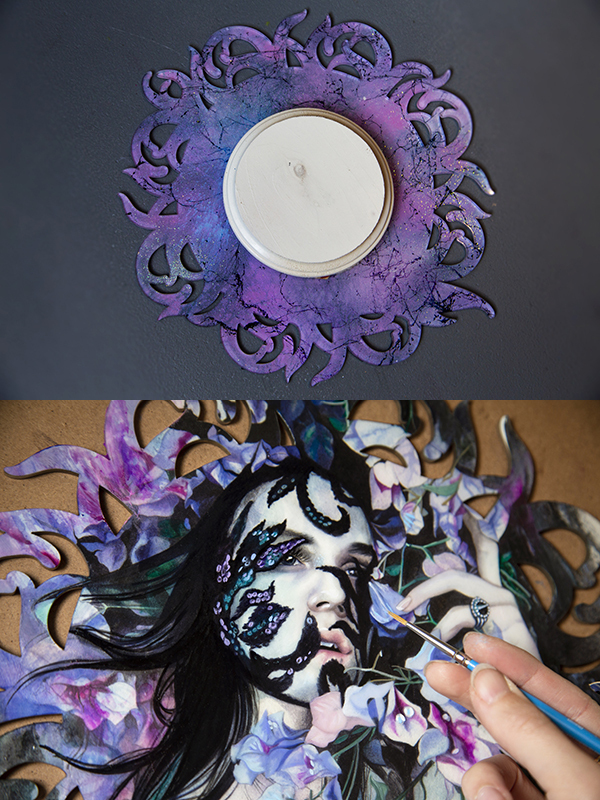 During art school, I spent several years trying different methods of layering rice-paper and various acrylic media to create the perfect paint surface, and eventually paired these techniques with oil paints and laser-cutters. As I embark on a more nomadic life next year, the process is likely to shift again, so if you’ve been holding out for a laser-cut piece now is the perfect chance! 1. 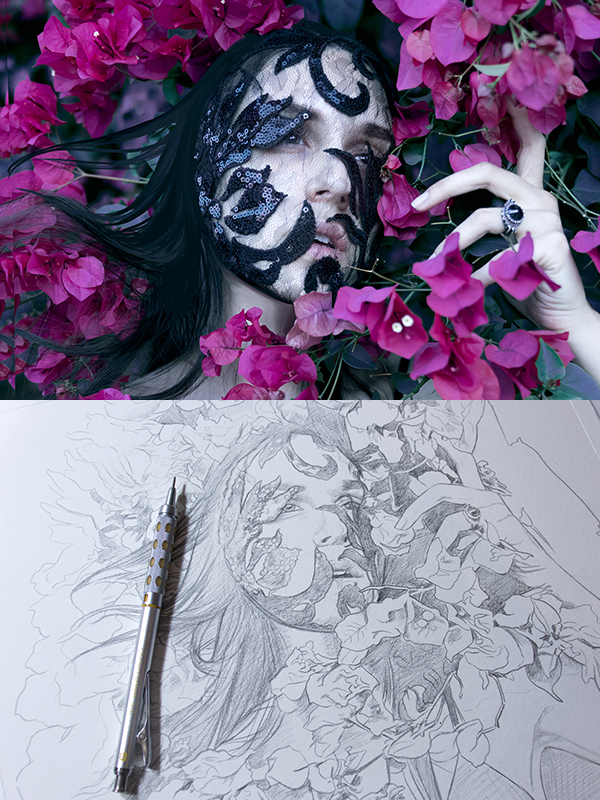 Most pieces begin with a vague idea and a super rough thumbnail, which is then realized as a reference photoshoot. I build whatever props and accessories are necessary for the shoot and scout for the perfect model. During the photoshoot, the idea takes on its more mature form. Often at this stage the model contributes something unexpected that I couldn’t have foreseen, but sometimes the images turn out just like my initial idea too! 2. Next I develop a preliminary mockup of the reference photo, and then turn it into a line drawing (just a guide to start the piece & ground the proportions.) This one was projected on watercolor paper, and then refined free-hand in the graphite drawing since the projection is pretty rough. 4. Even in watercolor, my process involves thin built up glazes. I start with some washes and salt effects, which give the piece its spontaneous and uncontrolled textures in the background and foliage. Then I build up the rest of the values in thin layers, laying in color and some detail. Someone once asked me how I can work so additively in watercolor, since colors can sometimes lift up. Part of the equation is using the correct paper for the job, I only work on Arches 300lb Hot Press, which has great absorption and really helps with building up many layers. In the darkest tones it also helps to have some of the first shadows rendered using the liquid acrylic (thinned to the right shade) since it will not lift as you glaze over it. You can see some of those half-tone shadows on her eyes and lips below. 5. Next I scan the watercolor (secret weapon: Bellevue Fine Art), and make small tweaks if needed like removing little blemishes or changing a color that wasn’t working for me. 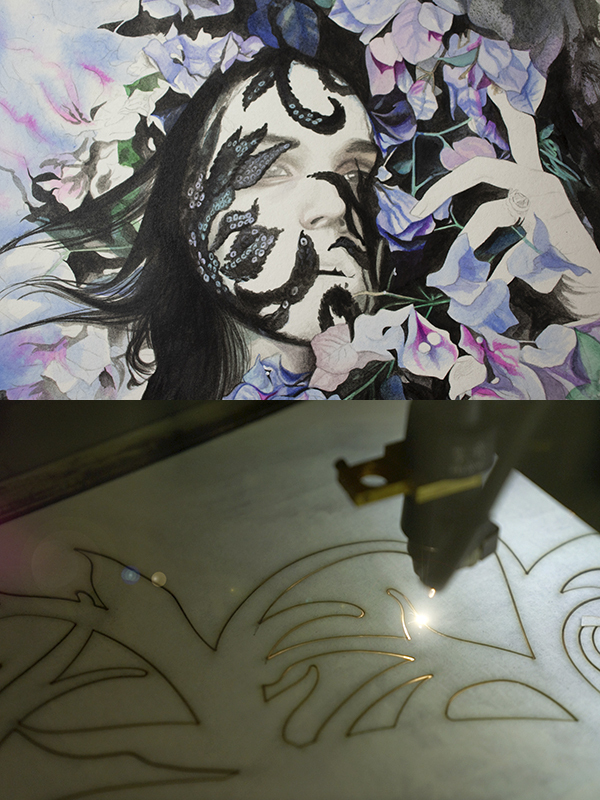 I’ll also extend textures around edges to fill the laser-cut frame and determine the scale of the finished painting. The panel is also prepared for laser-cutting, but more on that later! 6. I design the laser-cut frame to match the underpainting. Every frame is unique to its particular painting. I use Illustrator to make the vector file for the frame. 7. It’s time to laser-cut the panel, the fun and scary part! Machines aren’t perfect, and this step involves a lot of sweating and hoping there’s no fires or explosions! I work with a variety of Makerspaces, and generally use 80 to 120 Watt CO2 Laser Cutters. 8. Before the piece can be laser-cut, I print the watercolor underpainting on a thin archival rice-paper & mount it to gessoed panel, sealing it with acrylic coatings (like GAC 800 and matte medium). I’ve used both thin masonite wood and clear and colored acrylic panels. 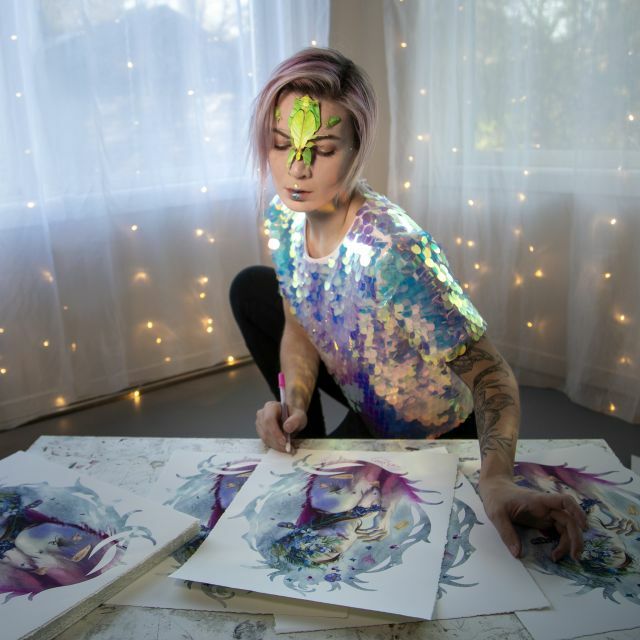 All of the current pieces have a secret abstract glitter painting embedded inside the surface itself, which is only visible from the reverse side! This little surprise adds just one more layer of magic to the object, just like the glimmering ice-edges along the filigree frame. 9. Finally its time for oils! I build up and finish the painting in lots of oil paint layers and glazes. Even though so many steps have already happened, this is the most time consuming part of my process. While the bones of the painting are firmly in place before I begin in oils, this stage is like the muscle and skin of the final piece. Most of the depth, nuance and detail happens here. Lately I’ve been playing with heavier knife textures in the backgrounds, and multiple glazes on skin and fabric, which makes a huge difference for the final piece. 10. When the piece is all done it just needs varnish. Usually a high-gloss (Liquitex Soluvar Gloss) varnish to tie everything together and make the dark areas and details pop. 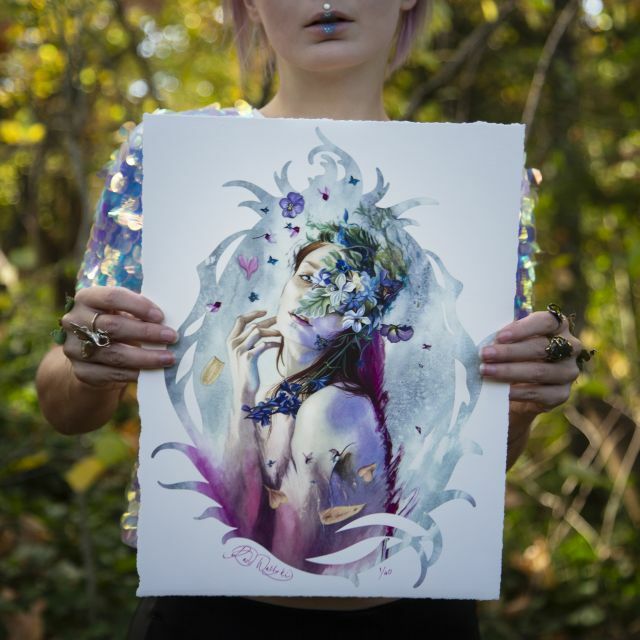 This season there’s too much going on for a laser-cut print release, but I am so excited to partner with People’s Print Shop to release a limited edition fine art print of “Veiled in Springtime”, which was also recently featured in American Art Collector Magazine! 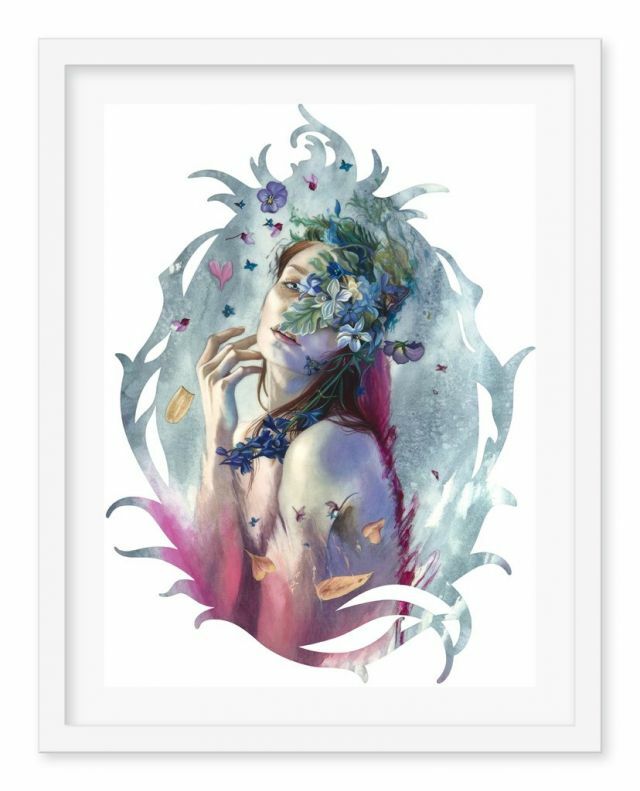 This small edition of only 40 prints is super affordable, and the color and quality of them is so gorgeous! As I’m sure most of you know, for self-employed artists every little bit helps to make future projects possible, so perhaps consider one of these as a holiday gift or sweet little addition to your collection! 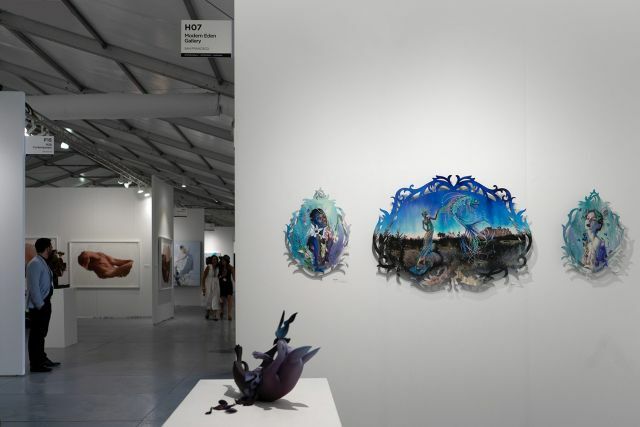 Finally, the big news is that this year, I’m creating a collection for Modern Eden Gallery at SCOPE Art Fair, and will also be attending the Miami Fair for the first time! It’s been a crazy month of finishing paintings and getting ready, but I couldn’t be more excited about getting to show on such an illustrious stage! If you’re headed to Miami too let me know so we can connect! Much love and wintery sparkles!